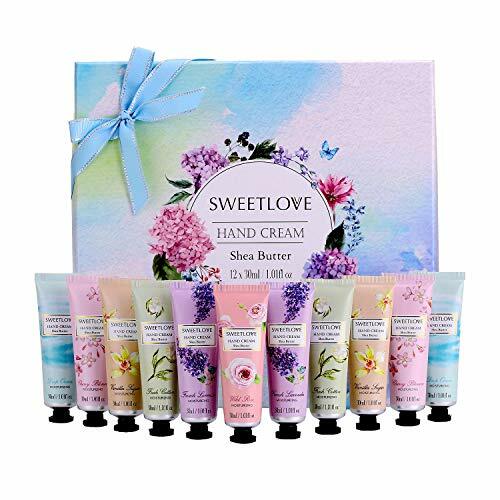 Hand Cream Gift Set, 12pc x 1floz Travel Size Hand Cream with Shea Butter, Natural Aloe, Vitamin E, Moisturizing for Dry Hand and Foot, Best Gift for Women, Mother's Day, Birthday, Christmas. DEEP NOURISHING HAND CREAM ❤ Enriched with shea butter, sweet almond oil, aloe, This rich, deeply hydrating and moisturizing hand cream leaves hands silky-soft, smooth and rejuvenated. Non-greasy formula absorbs quickly and feels comfortable all day,For All Skin Types.For best results apply after hand washing and bathing as these are the most effective times for moisturizing dry skin. 6 NATURAL FRAGRANCES❤ Wild Rose, Cherry Blossom, Lavender, Fresh Cotton, vanilla, Ocean. Pick and choose your favorite scent based on your mood at the moment from our 6 natural fragrances. TRAVEL SIZE❤12pcs*1.01 fl oz, For your purse and hand bag.You can use it at anywhere. THE PERFECT GIFT FOR ANY OCCASION ❤The ideal present for Christmas, Valentine's, Mother's Day, Birthdays and Anniversaries. A bridesmaid gift on your wedding day perhaps, or a a retirement/leaving gift or just a way of saying - congratulations, thank you or I love you to someone special in your thoughts. 100% SATISFACTION GUARANTEE ❤ 60 days refunding without reasons. Whatever issue of the product, no question asked, no time limits on returns. Feel free to contact us for five-star customer service. you can buy with confidence. RUN! HP 15.6” Laptop Touchscreen Windows 10 ONLY $40! !